Sometimes you want to copy an important information in your Android phone so as to save it in Notes or to send it to your friends via Mail, WhatsApp, Facebook etc., Android has an in-built option to copy the editable text to clipboard. That's pretty much easy. Either tap and hold or double-tap the text to select it, then click copy (or cut) option to copy it to clipboard. Once after this, you can easily paste it any where. You might have noticed that on some places, especially in apps, you don't have permission to copy the text directly. Now consider a slightly different scenario. You are using an app (say Facebook or Twitter) and suddenly found something interesting that you want to copy and share with someone else. It would be a time-consuming task to type the whole text in Notes manually. Right? In order to copy the text from such places, you have to use other third-party applications, of course, as Android's in-built clipboard feature doesn't work there. Here I have found two solutions for your problem. Read on to find out how. 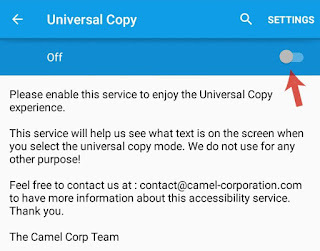 Universal Copy, as name itself suggests, is an Android app that will help to copy the text from apps which don't support default clipboard feature such as Facebook, Twitter, Instagram and many more. You can install this app from Google Play Store and good thing is that, it's just 1.5MB in size. After installing, launch the app and then enable it. For the first time, you have to give an accessibility permission to this app. Either follow on-screen instructions or go to "Settings > Accessibility > Universal Copy" (under service) and then switch on the button at the top-right corner of the screen. To allow permission, simply click OK button and that's it. 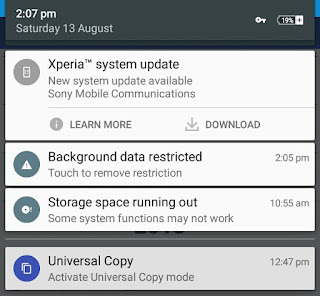 Now you will find a non-removable and sticky notification in your phone's notification tab. First open the app from where you want to copy the text (say Facebook or Twitter). 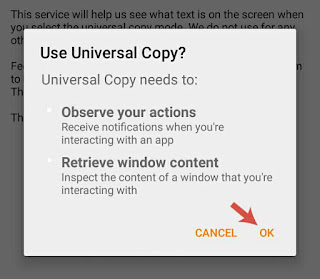 Now click the Universal Copy's notification to activate it. 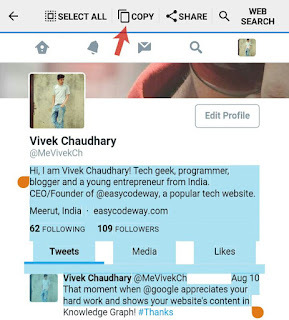 After this, tap the text you want to copy and then click copy icon as shown in below picture. That's it. Now the selected text will be copied to clipboard automatically and you can paste it anywhere. From the same screen, you can also edit the selected text and enter the full screen mode. If you want to remove that sticky notification, either turn off the app permission from accessibility or uninstall the app when not in use. For the fun part, I have also tried this app on an image to copy text from it but unfortunately, it doesn't worked at all. For that task, you can use other OCR (stands for Optical Character Reader) apps such as Text Fairy and CamScanner. To be clear, let me tell you that this is not the right method and it may not in every case. What we are going to do is very simple. 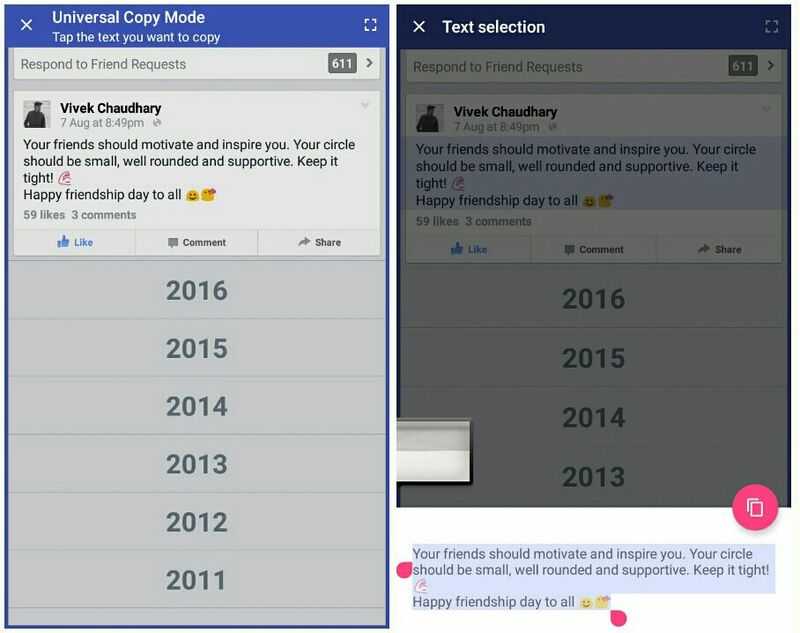 For instance, if you want to copy the status from your friend's wall, you just have to open its profile in browser, where you can easily copy the text directly. Note that, we are assuming that the app has its official website from where all content is accessible. Every Android phone has a built-in browser app. Google Chrome is a common example. However, there are a couple of other third-party browsers available like UC Browser or Mozilla Firefox, which you can install from Google Play Store for free. Once after installing, open the browser app and make sure to turn on the data traffic or Wi-Fi. Now you can save or paste it any where such as in your WhatsApp status, Notes, Facebook or Twitter. 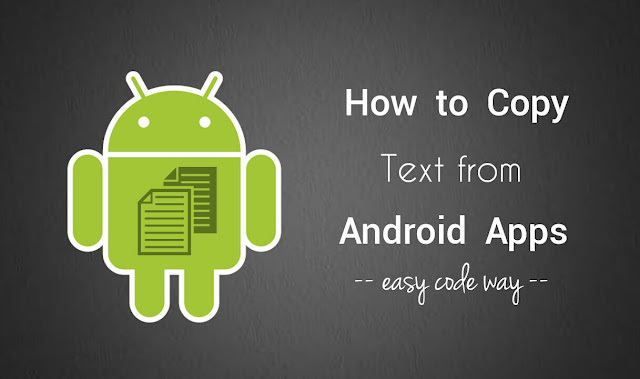 So this is how you can copy the unselectable text from any Android app. If you have any doubts, feel free to share them in the comments. Did you know any other better way?